Date: Late 3rd – 4th century AD. Northwest Empire, Gaul or Rhineland. Size: H: 18.5 cm. Dmax: 8.6 cm. Drim: 5.4 cm. Dbase: 7.1 cm. Weight: 219 gr. Classification: Isings 1957: Form 128., Morin-Jean 1913: Form 132., Sennequier 2013: Form HN 15.2., Goethert-Polaschek 1977: Form 142. Condition: Intact. Some weathering and iridescence. Technique: Body blown in three-part mold with two vertical sections and one section for the base. Mouth and neck free blown. Handles applied. Description:Transparent pale yellowish green tinted glass. Cylindrical body divided in three horizontal bands of roughly equal height. Top band has five, bottom band six continuous horizontal ribs, imitating hoops binding wooden staves. The central band is plain and slightly convex. Horizontal shoulder with rounded edge. Cylindrical neck slightly tapering upwards to horizontal rim. Rim folded out, up and in to form a narrow flange with rounded edge. Slightly concave base with concentric circle around pontil mark. Two opposite broad strap handles with ribs on either edge drawn up from edge of shoulder, bent at straight angle and attached with a fold to the neck and underside of rim. Prominent vertical mold seams under right side of handles from shoulder down to base. (1) Three different mold-types for barrel-shaped bottles have been identified. This bottle was blown in a three-part mold: one part for each vertical half and one for the base. The second mold-type had two vertical sections, each of them extending to the underside of the base where the mold seams formed a horseshoe-shaped pattern (see NFB 373). The third mold-type consisted of two identical halves, resulting in two vertical mold-seams and a straight seam across the middle of the base. (2) Barrel-shaped bottles imitate the larger wooden barrels that were used for storage of liquids (wine, beer, oil). They were exclusively made in the Western Empire, mainly in the northwest of Gaul and the Rhineland. The earliest ones have one handle (NFB 373), later examples have two handles (NFB 372). The bottles were standardized in size to contain a certain quantity of liquid. Provenance: Sheikh Saud Bin Mohamed Ali Althani Collection, Doha, Qatar. Louis-Gabriel Bellon Collection, Saint-Nicolas, France (1819-1899). Published: Jack-Philippe Ruellan, 4 April 2009, No. 192. Dilly & Mahéo 1997, Musée de Picardie, No. 73. Welker 1987, Museum für Vor- und Frühgeschichte Frankfurt am Main, Nos. 14-15. Arveiller-Dulong 1985, Musée Archeologique de Strasbourg, Nos. 373-375. Val-d’Oise 1993, Musée Archeologique Departemental du Val-d’Oise, No. 176. Metropolitan Museum New York, accession number 17.194.190. * Same mold-construction as NFB 373. Date: 2nd – 3rd century AD. Northwest Empire, Gaul, Normandy. Dimensions: H: 17.8 cm. Dmax: 8.6 cm. Drim: 4.2 cm. Dbase: 8.3 cm. Weight: 200 gr. Classification: Isings 1957: Form 89. Morin-Jean 1913: Form 132. Sennequier 1993: Form HN.15.1. Goethert-Polaschek 1977: Form 121. Technique: Body blown in mold with two vertical sections, each of them including a part of the base section, with a mold-seam in the form of a horse-shoe on the bottom. Mouth and neck free blown. Handle applied. Description: Transparent bluish green glass. Cylindrical body divided in three horizontal bands of roughly equal height. Top and bottom bands have six continuous horizontal ribs each, the central band is plain and slightly convex. Near horizontal shoulder with rounded edge. Cylindrical neck slightly tapering upwards to horizontal rim. Rim folded out, up and in to form a narrow flange with rounded edge. Infolded part of rim descends into the neck. Flat base with pontil mark and mold-seam in the form of a horse-shoe. Broad handle with two faint side-ribs drawn up from edge of shoulder, bent slightly downwards and attached with a fold to neck and underside of rim. Vertical mold-seams (one adjacent to handle) from lower neck, down the body to underside of bottom. 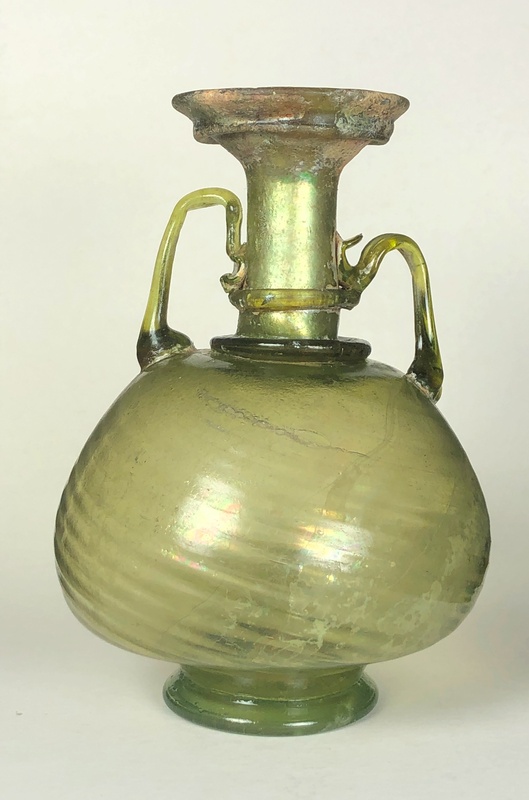 (1) This bottle was unearthed in 1875 by Louis-Gabriel Bellon (1819-1899), a French archaeologist and collector, who carried out regular excavations in Northwest France. Mr. Bellon marked many of the unearthed objects with find-place and –year and other information. The underside of this bottle carries a sticker with his handwritten text “Amiens 1875”. (2) According to Stern the horse-shoe formed pattern on the underside of the bottom is characteristic for barrel-shaped bottles made in Normandy (Stern 2001, No. 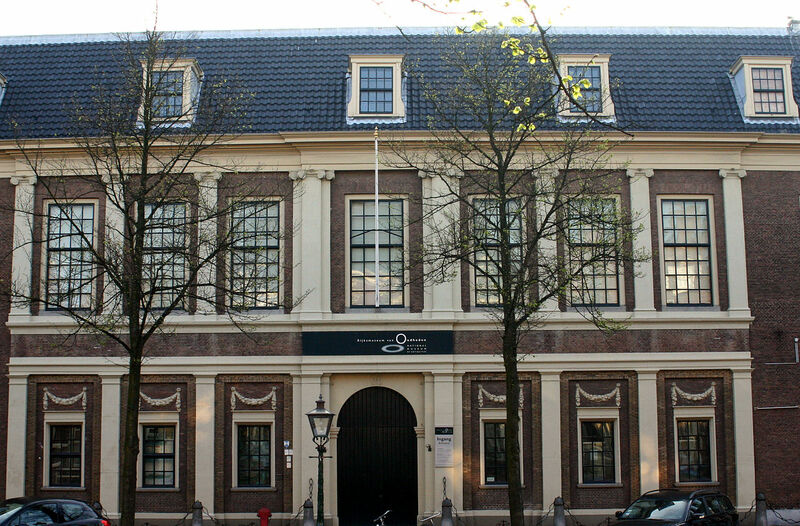 76). Examination by Gaitzsch and Fullmann-Scholz (Bonner Jahrbücher 2000) of 28 published barrel-shaped bottles with the trademark ECVA on the base shows, that all of them have the horse-shoe mold-seam. 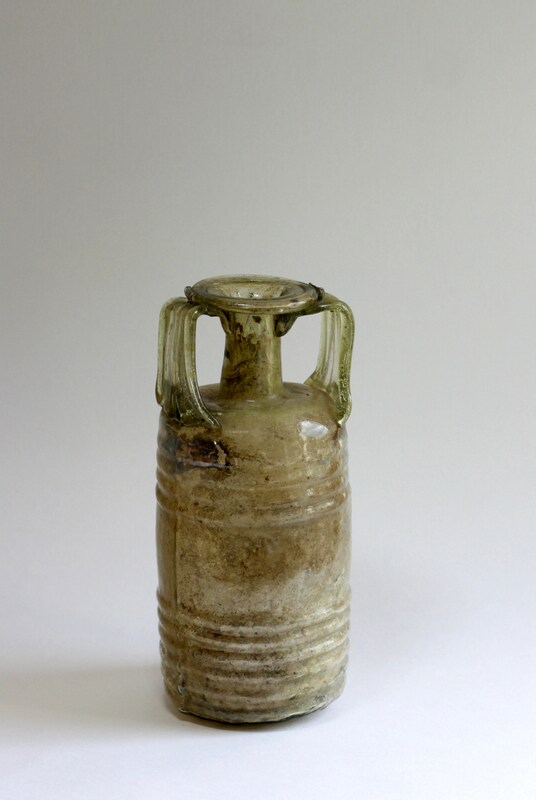 Since these bottles were produced in workshops around Cologne (Hambacher Forest), it is reasonable to conclude, that this mold-type was not (only) characteristic for the production in Normandy but (also) for Rhenish products. Sheikh Saud Bin Mohamed Ali Althani Collection, Doha, Qatar. Louis-Gabriel Bellon Collection, Saint-Nicolas, France (1819-1899). Jack-Philippe Ruellan Enchères 4 April 2009, No. 194., Corinne Helin, August 2016, Louis-Gabriel Bellon (1819-1899) et sa collection d’antiques. Whitehouse 2001, Corning Museum, No. 589. Heinemeyer 1966, Kunstmuseum Düsseldorf/Hentrich, Nos. 53-54. Simon-Hernand 2000, Musees de Poitiers, No. 68. Arveiller-Dulong 1985, Musée Archéologique de Srasbourg, Nos.170-171. Sennequier 1985, Musée des Antiquités de Rouen, No. 275. Dilly & Maheo 1997, Musee de Picardie, Nos. 42-45, 48-51, 54-61. Metropolitan Museum New York, accession number 81.10.73 (also from Amiens). 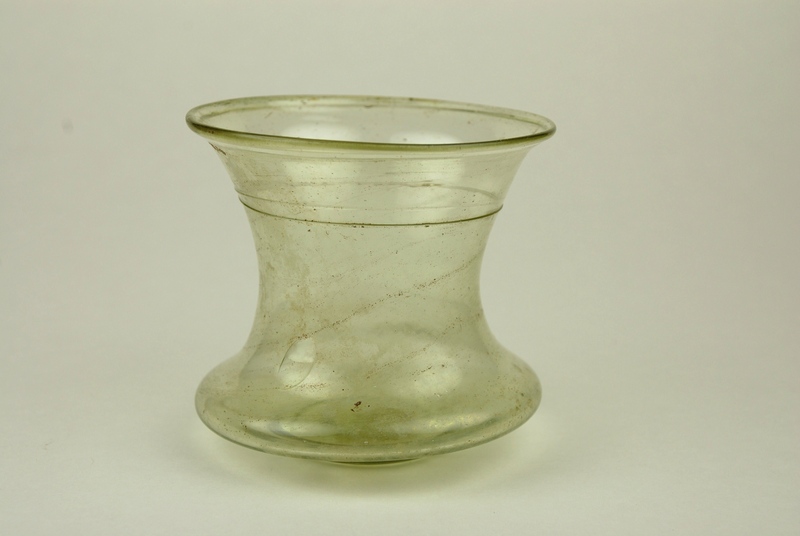 This rather large pale yellow-green concaved beaker with a thin glass trail around its center has the elements of both a 1st C. Roman jar and a 5th C. Merovingian bell beaker. Parallels have been found of similar vessels from both periods but the definitive answer is still unresolved. Characteristics: Mostly made with blue green glass with one sub-group using Christian symbols and the second sub-group having stylized crosses, columns, palm fronds & simple geometric patterns. Below are examples of this group. 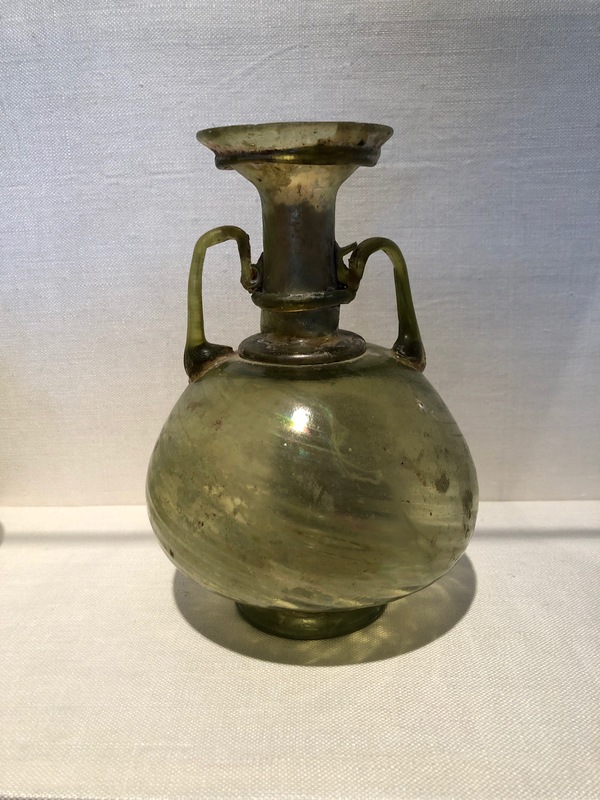 Characteristics: Mostly made with brown, sometimes bluish green glass with one sub-group using Christian, Jewish or geometric pattern symbols in four sided vessels. The second sub-group also in brown glass in two shapes jugs and jars both squat in hexagonal vessels. Also stylized with Christian, Jewish or geometric patterns symbols. Karanis was a town in the Ptolemaic Kingdom of Egypt know today as Kom Oshim. It is located in the northeast corner of the Faiyum. It was one of a number of towns established in the Arsinoite nome under Ptolemy II Philadelphus as part of a scheme to settle Greek mercenaries among the Egyptians and to exploit the potential fertile Fayum basin. Karanis 1st BC to 5th C was mainly an agricultural town which expanded in prosperity after Augustus conquered Egypt in the 1st century and well into the 2nd century. This archaeological site was active from 1924 to 1935. The glass found has a very particular style and type and is sometimes referred to as Karanis glass. 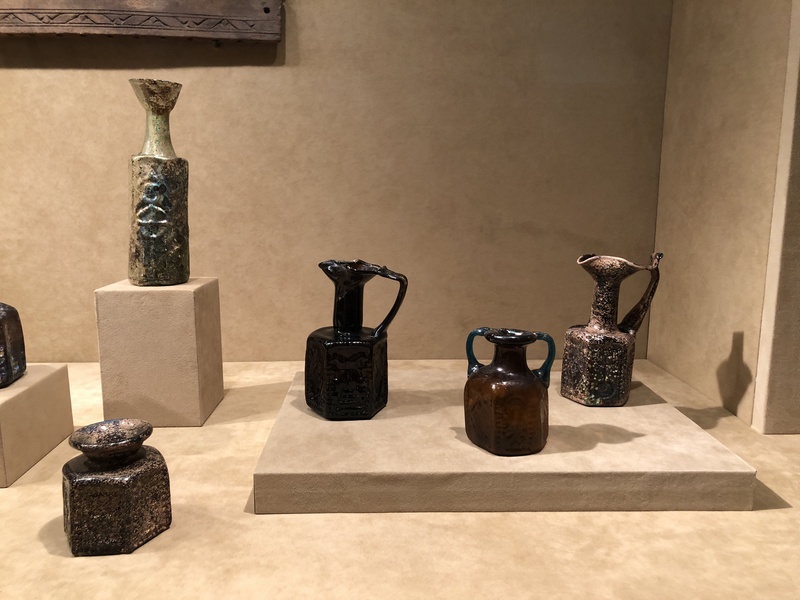 These vessels may have been made locally or imported from some other location in Egypt. Francis W. Kelsey, a professor of Latin language and literature at the University of Michigan received grants to search for an excavation site in 1924. Starting excavations of Karanis in 1925, his goal was to “increase exact knowledge rather than the amassing of collections”, with a focus on common people. The Kelsey Museum of Archaeology is located at the University of Michigan in Ann Arbor, MI. 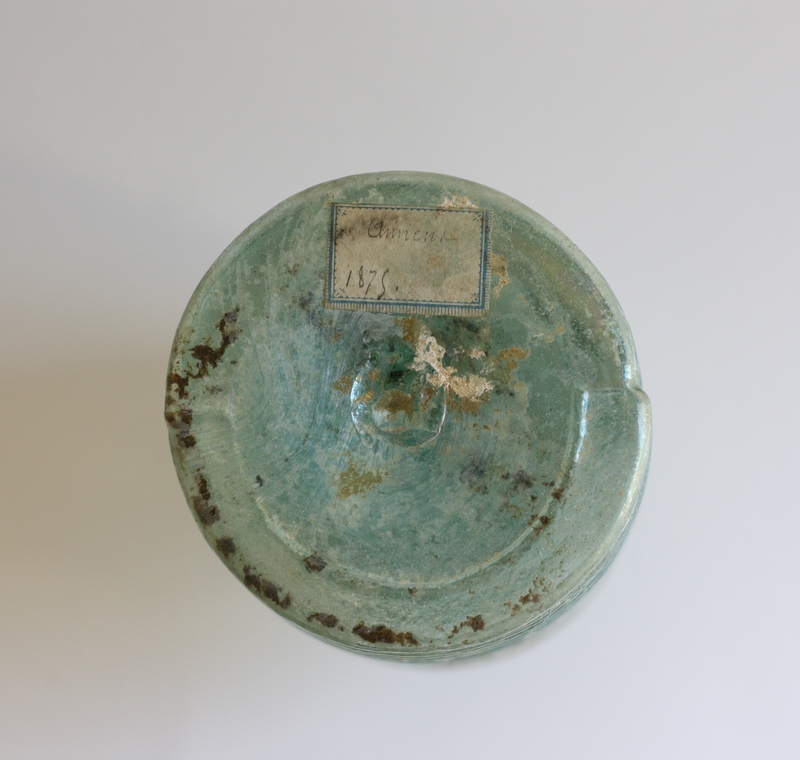 KMA houses an important collection of provenanced glass fragments and vessels (ca. 1,300 items) from the archaeological site of Karanis the Greco-Roman Egyptian town, in Egypt. The glass pictured below is from this museum. More recent excavations have been done by the Cairo University, the French Institute, and for the last few years by a combined collaboration of UCLA and the University of Groningen (RUG) in the Netherlands. 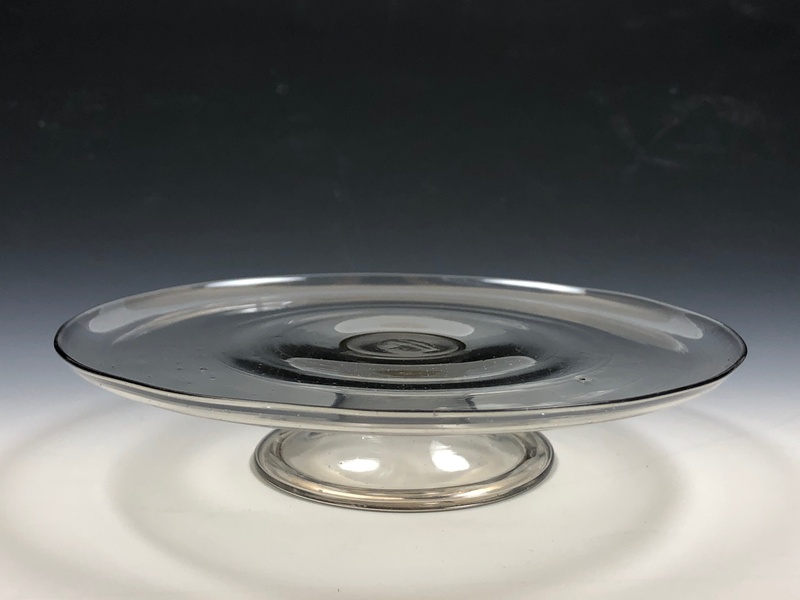 The honeycomb pattern makes one of the most beautiful types of Roman glass bowls. It is a decorative molded pattern of irregularly shaped hexagons, used as an overall pattern on these Roman glass bowls of the 4th century. They are said to have been made in Syria or Egypt and probably widely exported to many places where they have been found. The chemistry behind making blue glass is complex. The simple answer is finely powdered oxides of cobalt or copper are added to the glass batch. Almost from the very beginnings of glass manufacture the color blue has been a chosen hue. Beginning with a core-formed piece from 4th to 6th Century BC and ending with an example made by John Nygren from the studio glass movement of the early 1980’s. 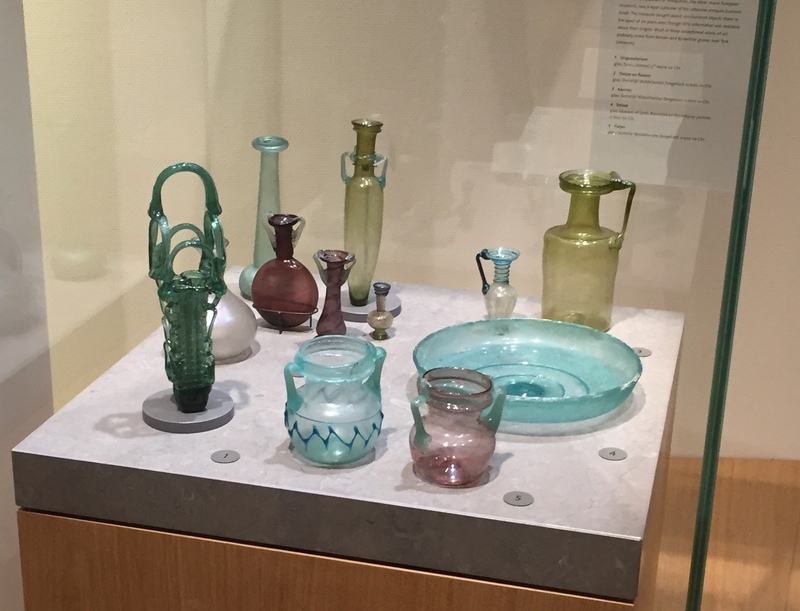 Glassmakers from antiquity were exceptionally adept at making the most beautiful shapes and colors. The Glass exhibition reflects their craftsmanship. You will see a selection of the most beautiful glass from the museum collection, which comes from Egypt, the Classic world and the Netherlands. For the gourmets among the art lovers. 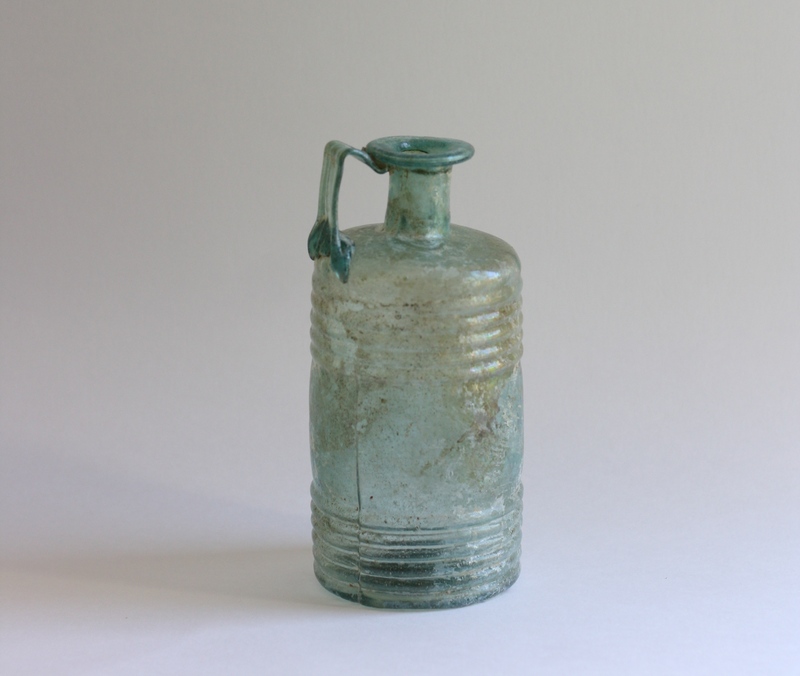 In the exhibition you will see some of the earliest glass objects from ancient Egypt, such as cosmetic bottles and amulets. Also Roman glass, bracelets from the European Iron Age (the ‘La Tene period’), jewelery, gems, play stones, Greek glass, special Merovingian cups and some early Islamic glasses are among the highlights. Below are some of our favorite glasses from this wonderful collection.